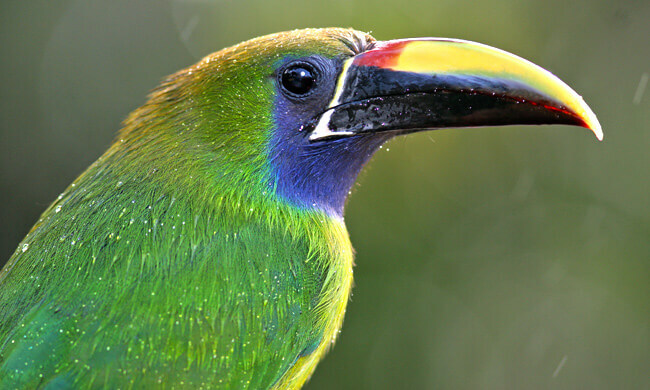 Costa Rica is home to 850 types of birds, making the country a birdwatcher’s and nature lover’s dream! In the Arenal area it is not unusual to see a keel-billed toucan, a Montezuma oropenula, or a laughing falcon, to name just a few. This birdwatching tour takes you to some of the most breathtaking places in Arenal. Your day starts very early at around 5:30 a.m., when you are picked up from your hotel for a drive to either the rainforest, Lake Arenal, El Silencio Nature Reserve, or the Proyecto Asis Animal Rescue Refuge. Your location depends on the season and the best birdwatching options. Your guide will know best, and wherever you head, there will be an amazing concentration of bird life awaiting you! Your guide will be a wealth of knowledge, and with eagle eyes you won’t be disappointed by the variety of birds you will spot. Enjoy the beautiful Costa Rican morning and natural beauty all around you, before heading back to your hotel for some breakfast. Tour includes: Transportation from/to your hotel, specialized guide, trail entrances, snack. What to bring: Secure shoes for hiking, comfortable clothes, long pants, bug repellent, camera, binoculars, sunscreen.